Roelf attended the University of Stellenbosch where he obtained a B.Econ degree, majoring in political science and economics, and obtained his LLB. Degree through UNISA. 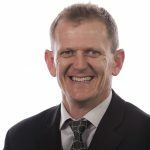 Roelf specialises in commercial work, insurance law and conveyancing and holds a certificate in Advanced Commercial Law from LSSA & ISLP. Roelf is the chief executive officer of the VanderMerwe & Robertson Group and heads up our Cape Town Office.